Our How To Install Metal Roof guide outlines the general steps that would be involved in installing a metal porch roof so you can decide if this project is within your capabilities. Metal roofs costs significantly more than traditional asphalt shingled roofs. However, they can last far longer and are perfect for areas prone to wildfires. Mary and I love the look of a metal porch roof; there's nothing quite like it. And there are so many color options too. 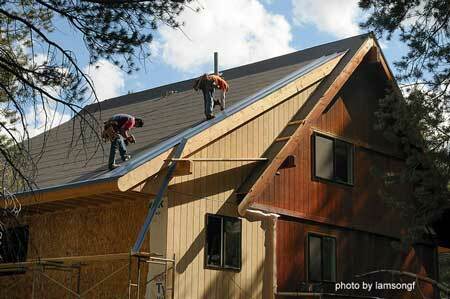 When installing a metal roof, you must pay attention to the smallest details. Our How To Install a Metal Roof guide will give you basic information about installing a colorful porch roof. Metal roofs are perhaps one of the only products that will actually outlive its warranty. Metal roofs have been on homes for hundreds of years in United States. Europeans have had them for centuries. A metal roof, especially with the technology today using zinc and aluminum coatings and innovative painting systems, can last a lifetime. There are actually a few manufacturers that offer lifetime warranties. Although from the ground it looks fairly easy, metal roof installation takes both special tools, a working knowledge of those tools, and roofing experience. Most homeowners do not possess these skills and should consult with a licensed metal roofing contractor. Our How To Install Metal Roof guide will explain the steps for both standing seam metal roofing and metal shingles. The following steps are for assessment purposes only and should not be used for actual construction. Be sure to follow all manufacturers instructions to the letter if installing metal roofing yourself. You should also consult with your local building codes department prior to installation to ensure your project meets local code requirements. You should realize a standing seam metal roof is more difficult to install than metal shingles although it is the most popular. Include at least 3 - 6 inches of overlap and the same for overhangs along the roof perimeter when ordering your metal panels. A metal roofing square is 100 square feet - you'll be ordering by the square. Roofing is dangerous work. I've fallen off a ladder; it wasn't the fall that hurt but rather that sudden stop at the end. Keep children away - period. 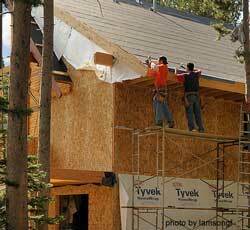 Your first issue is whether or not to remove the existing shingles. It is recommend that you do remove the shingles for standing seam metal roofs. If you don't, you may find that asphalt shingles can cause dents and lines over time when using standing seam metal panels. Removing the existing shingles will also expose deck roof damage and you'll have the opportunity for repairs. Another reason to remove existing shingles is for the installation of a water barrier. Condensation occurs due to temperature fluctuations. Your metal porch roof will last over 50 years or more so having the best roof underlayment is a wise investment. 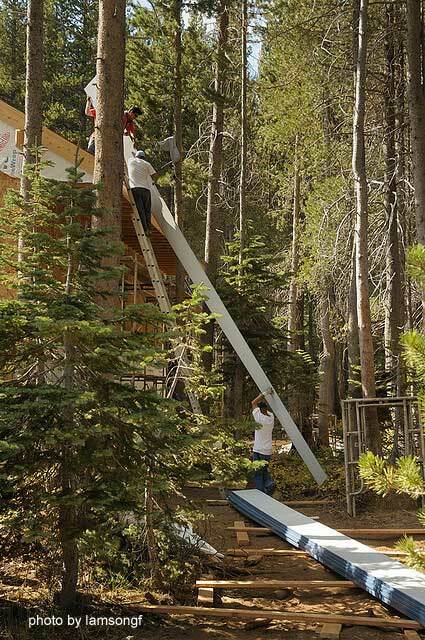 You will want to cover the entire roof with the underlayment. If you live in snow and ice country you need to take it one step further by laying down a row width of ice and water barrier along the eaves and valleys. I've used ice and water barrier and I'm sold on its ability to prevent water damage. Standing seam metal roofs are made from sheet metal roof panels joined and attached to the roof decking with hidden fasteners. Panels are typically 12, 16, or 19 inches wide and are made from copper, aluminum, or galvanized steel. Ribs are formed when the panels are joined and can be anywhere from 1 inch to 1 1/2 inches in height. To accommodate standing seam panels, your roof must have a 2:12 rise and run (sometimes called pitch). However, you may find some manufacturers that require more pitch so be sure your roof meets or exceeds their product specifications. We show you how to calculate the rise and run of your porch roof. Use the right fasteners either supplied or approved by the manufacturer. Each overlapping panel hides the fasteners of the panel already in place. 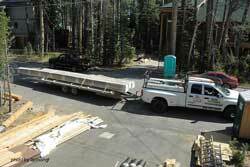 Panels are either formed at your home or can be cut and delivered by the manufacturer. Make sure you have adequate space around your home to work with the panels. Like any roofing project, installing the drip edge is the first step. Repeat this process for the gable rake. Don't forget to lay the underlayment over the fascia trim to prevent water from collecting under the drip edge. Photo shown here is courtesy of Lamsongf. Now its time to install the first sheet metal panel in our "how to install metal roof" process. 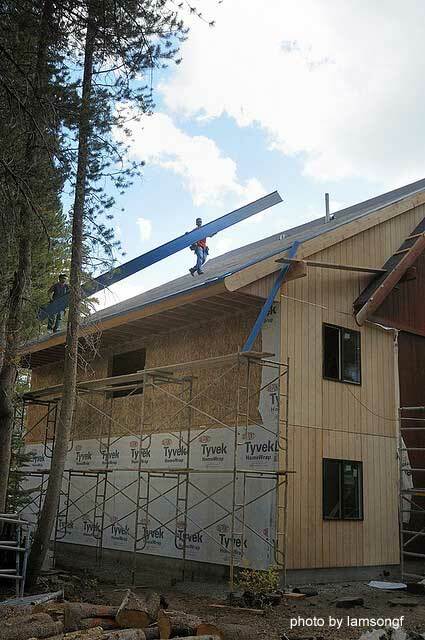 Normally you will install the first panel over the gable edge trim. This is where it is extremely important to follow manufacturer's installation instructions. Continue fastening panels by securing them with hidden fasteners. It is nearly impossible to show each step in our How To Install Metal Roof guide as the process is dependent on the product manufacturer. Working around vents, chimneys, etc., can be tricky and requires experience to ensure a tight seal. That's why we recommend you consult with a licensed contractor. If attempting this yourself as a homeowner, we recommend you roof a small outbuilding or shed first to gain more experience first. 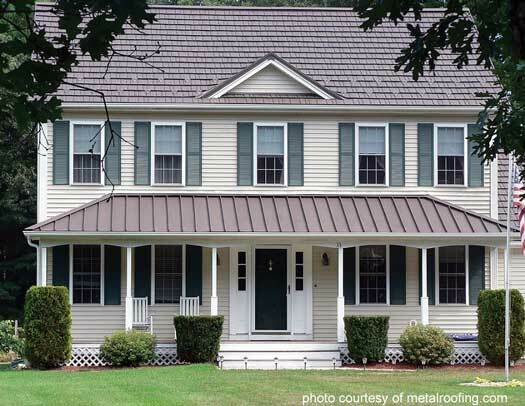 Discover all of your metal porch roof options - there are many!